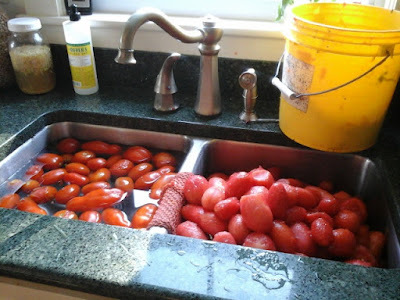 Journey to New Hampshire Homestead: Last of the Tomatoes! I canned the last big batch of tomatoes today. There are only a few stragglers left on the vines, and I pulled up most of the plants. These tomatoes weighed in at 50 pounds. Here they are almost all peeled. 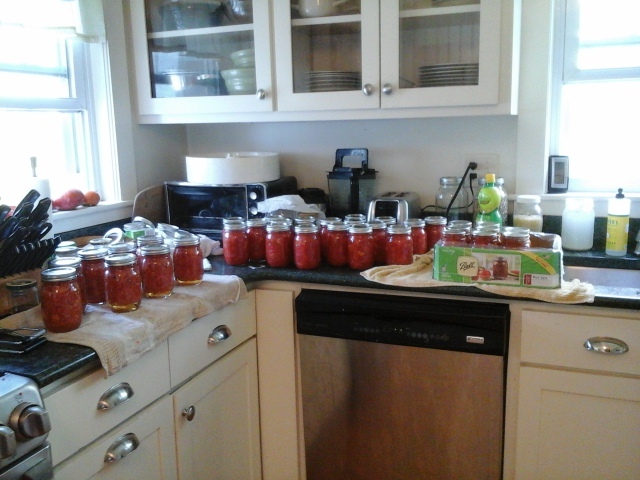 last one I just put in the frig, not wanting to run the canner for only one more jar. This took pretty much all day. It feels good to have it all done. And here is the west side of the barn- the horse part. 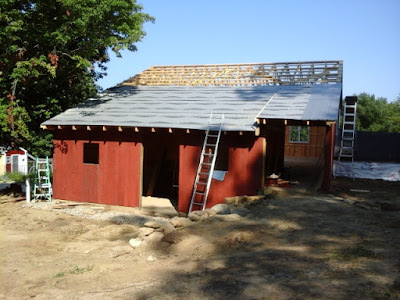 The metal roof is supposed to go on tomorrow. I hope so, as we are expecting rain Thursday. Hmmmm. Looks interesting. I just have the old strainer, but this might be a good purchase. Thanks for the tip!